The pieces are shaped like the states. Children's geography lesson of the USA packed in an entertaining puzzle. Includes national landmarks and illustrations representing state nicknames. Includes all of the state capitals on 55 sturdy jumbo pieces. Since the pieces are shaped like the states of the USA, a child cannot complete this 55-piece puzzle without figuring out where every country is located. No other puzzle comes with such a superb geography lesson! Build the puzzle and learn the USA. Further, there are numerous illustrations that designate famous landmarks and state nicknames. 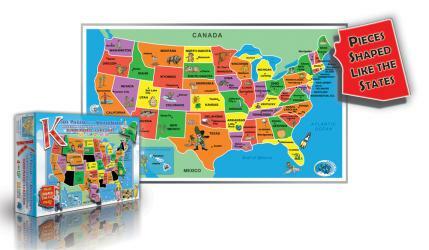 Every state's capital is also labeled and marked in its location. The pieces are large and sturdy to enable kids to easily handle the pieces and the pieces to easily withstand the kids. They are all larger than tight government standards for choking hazards, so the pieces are safe to be around babies if you happen to have some around. In some cases, multiple states have been combined into one piece to ensure there are no potential choking hazards. GeoPuzzles make learning geography fun! Each Geopuzzle has pieces shaped like countries, and helps to build fine motor, cognitive, language, and problem-solving skills. 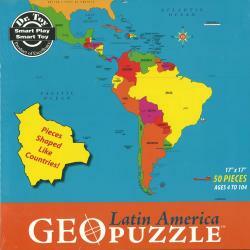 GeoPuzzle Latin America has 50 jumbo-sized pieces, and is 17 x 17 inches. Ages 4 and up. Made in Germany from recycled materials. GeoPuzzles make learning geography fun! Each Geopuzzle has pieces shaped like countries, and helps to build fine motor, cognitive, language, and problem-solving skills. 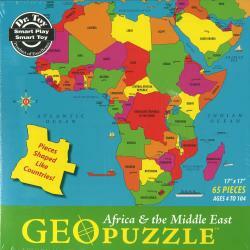 GeoPuzzle Africa & the Middle East has 65 jumbo-sized pieces, and is 17 x 17 inches. Ages 4 and up. Made in Germany from recycled materials.